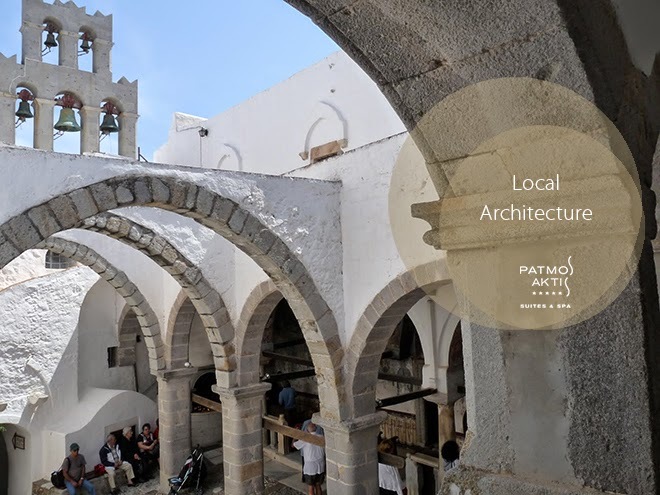 Although, one of the islands of the Dodecanese, Patmos features an architecture very similar to the Cycladic style. Whitewashed, stone-built houses with colorful windows and doors, and blue domed churches abound in the two traditional settlements of the island, Skala and Chora. Around the island visitors will also find many mansions with imposing facades and elaborated details, samples of the once flourishing era of the island. What's more the scenic local architecture is further enhanced by the winding stone paved alleys surrounding the houses. Neoclassical buildings are also harmoniously blending with the traditional style, proving the island's long history, as are the structures dating back in the Byzantine era, such as the famous Monastery of St. John in Chora. Thus, following the typical, yet beautiful local architecture, Patmos Aktis offers accommodation in whitewashed units decorated in neutral colors and light wood furnishings. The outdoor areas are also smoothly blending with the surroundings, as the blue swimming pools add a colorful touch, only to create a setting bearing the signature of Greece! So, if you wish to unwind body and mind, visit Patmos this summer and rejuvenate yourself in all that white and blue!